I was at a summer employee event and besides the food and drinks, there were various activities scattered about. Little islands of fun like bean bag toss, tug-of-war, and my personal favorite, the giant bubble station. There is something magical about bubbles and the giant ones seem to defy the laws of nature. After receiving some encouragement and tips from the bubble station master, I decided this would be a fun summer activity to try out with my family. There is almost too much information out there on making homemade giant bubble mix. So if you want to avoid going down that rabbit hole, see below for my EZPZ solution. 1. Mix guar gum powder and isopropyl alcohol to make a clump-free slurry. 2. While stirring roughly half the water in a mixing vessel, add the slurry. 3. Let the water/slurry mix rest for a few minutes to let it thicken. 4. Add the rest of the water. Now go enjoy some magical giant bubbles! P.S. A link for making wands for your bubbles. My favorite is the tri-wand. Have you ever woken up in the middle of night where you can't get to sleep because it feels too hot? Or maybe, like some of my family members, who shall remain unnamed, you suffer from the affliction of "hot head" when sleeping. No medical danger here. Just a super-heating of the head when you fall asleep. One solution is to flip over your pillow to the cool side so you can drift off to sleep again. However, at 3 a.m. in the morning this normally effortless maneuver can seem like a chore. I recently found an EZPZ solution to help. It's called the Chillow and it's basically what it sounds like. 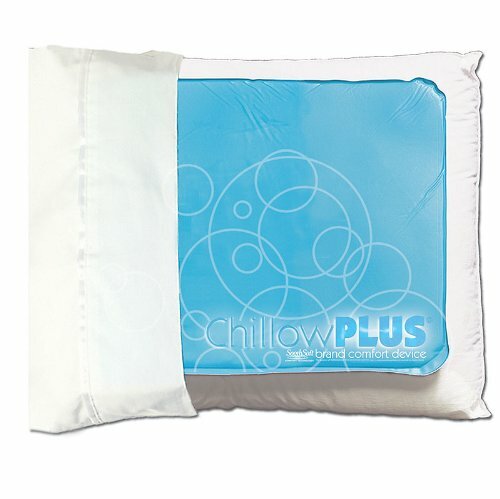 A pillow that stay's chilled better than a regular pillow. I don't have the background to understand the magic that they employed to make this happen, but I can report back that it works. When you first receive it, you have to pour water inside, which gets absorbed by a foam-like filling inside which holds the arctic goodness. The Chillow is about the size of your pillow, but only about a half-inch high so you place it on top of your existing pillow. Money saving tip: The best part of buying the Chillow is if you participate in a Flexible Spending Account (FSA) offered by your employer, the Chillow is eligible for reimbursement. Just remember to save your receipt!